On behalf of NAMI’s Board of Directors, I am very pleased to announce that we have chosen Mary Giliberti to serve as the next Executive Director. Mary succeeds Mike Fitzpatrick, who announced this past January that he would be stepping down at the end of the year. Prior to joining NAMI, Mary served as a section chief of the Office of Civil Rights at the U.S. Department of Health & Human Services. Before that she served as NAMI’s Director of Public Policy and Advocacy from 2006 to 2009, working closely with NAMI State Organizations and NAMI Affiliates. In addition to her role as Disability Counsel to the Senate Committee on Health, Education, Labor and Pensions, Mary also was a senior attorney for the Bazelon Center on Mental Health Law in Washington. Her focus has always been on the needs of individuals with disabilities, particularly those living with mental illness. Mary is a graduate of Harvard College and Yale Law School. 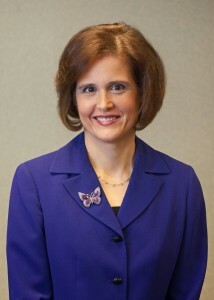 After graduation from law school, she clerked for Judge Phyllis Kravitz on the U.S. Court of Appeals for the 11th Circuit covering Alabama, Florida and Georgia. She grew up on Long Island in New York and lives in Arlington, Virginia. Mary strongly believes in NAMI’s mission, including education, support and advocacy. Throughout her career she’s been guided by a belief in the worth and dignity of every person. She knows NAMI and sees the passion and strength of NAMI members, NAMI State Organization and NAMI Affiliate leaders as our greatest resource. In January, Mary will begin to listen and talk with NAMI members, state and local leaders, supporters and thought leaders. With the NAMI National Board of Directors, we will develop a clearly articulated strategic plan and specific goals. In the long term, she looks forward to building on NAMI’s successes with greater visibility for NAMI, new ideas and new partnerships. As health care and mental health care systems continue to rapidly change, NAMI needs to be at the forefront leading the fight for accountable, effective services and supports for people affected by mental illness. Again thank you for your support as we welcome Mary back to the NAMI family.